The French "lunatique" means insane. Many ancient cultures blame the moon for insanity. Here, a full moon rising over the Re Island Bridge in Rivedoux, France. On this program we talk about common expressions in American English – where they come from and how to use them. Today we leave the mainstream -- the majority. We go to the edge of society – to the lunatic fringe. It is the radical part of a group or political party. Two other words that describe people who are part of the lunatic fringe are fanatics and zealots. Lunatics are mentally unstable people or people who behave very foolishly. The root of lunatic is “luna,” Latin for “moon.” The Old French “lunatique” means “insane.” The Online Etymology Dictionary explains that in the late 13th century, people who were mentally unstable were thought to be affected by changes of the moon. 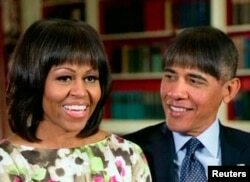 Now, the word “fringe” has several meanings. For example, fringe can be a decorative border. Curtains, pillows, tablecloths and clothing are all things that can have fringe. This meaning goes back hundreds of years. Fringe can also mean to be on the outer edge of something. For example, the family lived on the fringe of a national park. This is an actual area where their property meets the park. But you can also be on the fringe of something that you can’t physically touch. For example, my friend who lives in Los Angeles has worked on the fringe of the entertainment industry for many years. Fringe theater is theater that is experimental in style or subject matter. There are fringe theater festivals all over the world. One difference between fringe festivals and traditional arts festivals is the way performers are chosen. Usually, traditional festivals include a selection process. However, most fringe festivals do not. It is usually a first come, first served process. 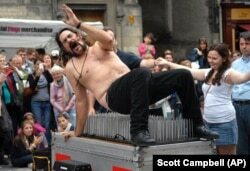 As a result, you can see some strange and different theater performances at a fringe festival. They are definitely not mainstream. The term comes from Scotland's Edinburgh Festival Fringe. According to the festival’s website, it dates back to 1947. 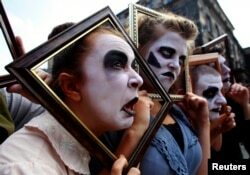 That year, eight uninvited theater groups came to perform at the recently formed Edinburgh International Festival. They weren’t part of the official festival. But this did not stop the performers. They performed on the fringe, or edge, of the official festival. That is the meaning of fringe that is part of today’s expression – lunatic fringe. The Online Etymology Dictionary says that, in the late 1800s, “lunatic fringe” described a type of hairstyle for young women. Women with this hairstyle wore their hair straight across their forehead. These days, in American English, we call the hair that falls over the forehead “bangs.” There are several examples of writers in the late 1800s using the phrase “lunatic fringe” to mean a hairstyle. ​In 1913, shortly after a failed attempt to become president again, Roosevelt wrote about an art exhibit of painters. These artists painted in ways no one had seen before. At the time, they were the "lunatic fringe" of the art world. Pablo Picasso is one of the most famous Cubist painters. 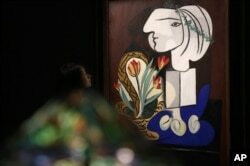 Here, a woman looks at his painting titled "Nature Morte Aux Tulipes" at an auction in Hong Kong, Oct. 2012. 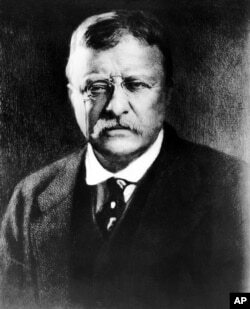 We cannot guarantee that Theodore Roosevelt was the first to borrow this expression from a women’s hair salon and use it in another type of salon -- one where important conversations of the day take place. But he does get the credit for making lunatic fringe more mainstream. "Lunatic Fringe, I know you're out there. You're in hiding and you hold your meetings." Anna Matteo wrote this story for VOA Learning English. Ashley Thompson was the editor. Red Rider sings "Lunatic Fringe" at the end of the story.